We decided to take it easy on our first full day at Cradle Mountain. Our plan was for all of us to do the Enchanted Walk in the morning while I would do the Dove Lake Circuit on my own in the afternoon. 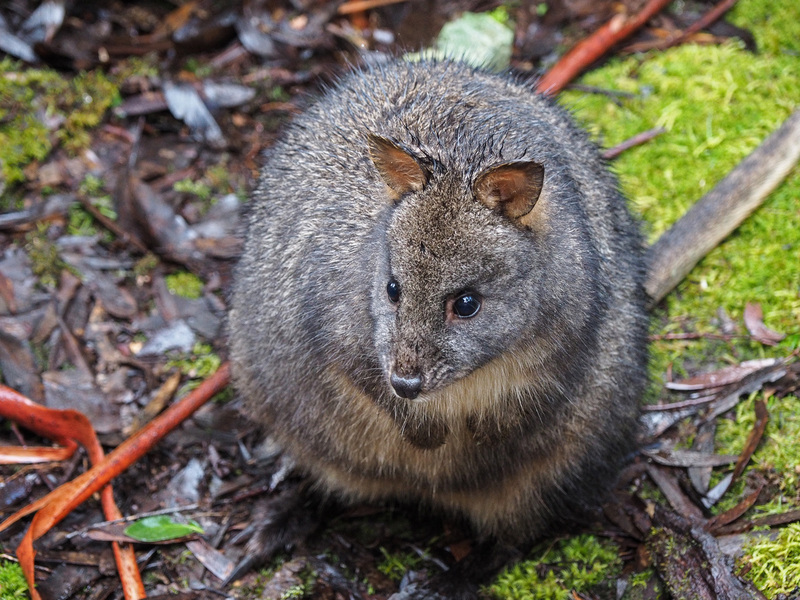 The day started off with another pleasant surprise (we soon discovered that Tasmania is full of pleasant surprises), a pademelon feeding just outside our cabin. 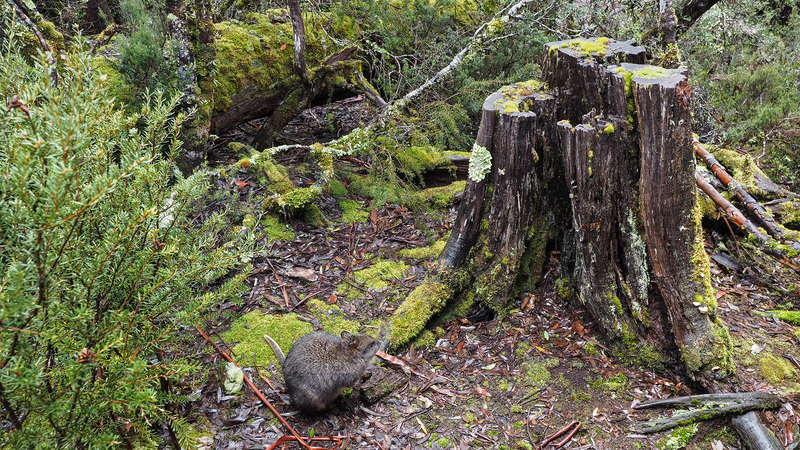 A pademelon at the back of our accommodation at Cradle Mountain. A close-up of the pademelon. My daughter absolutely loved the pademelon and every time we returned to our cabin she would look out the window and see if she could spot it. We mistakenly told her that it was a wallaby so she proceeded to ask about the “wobby” for the next two days. Location of the Enchanted Walk. You start by walking behind the lodge and within a very short distance you can hear the rushing waters of a stream nearby. The majority of the walk is beside this stream (Pencil Pine Creek). The water looks so pure and is deeply shaded by tannins. 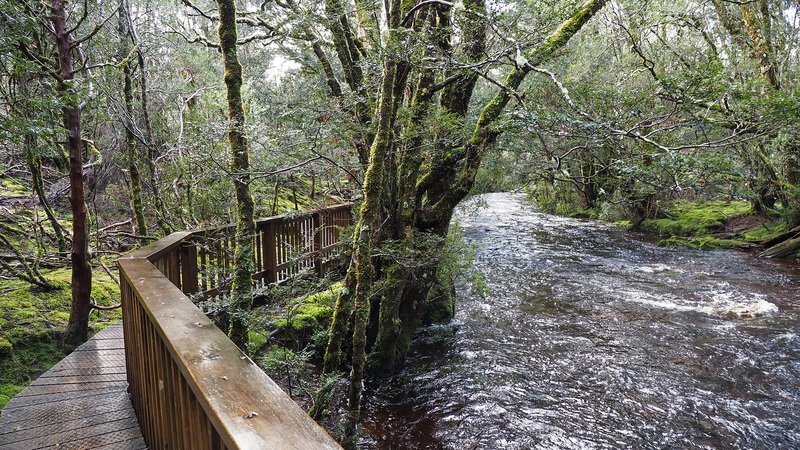 The Enchanted Walk closely follows Pencil Pine Creek for its entire length. Throughout the walk there are many opportunities to look across the creek. 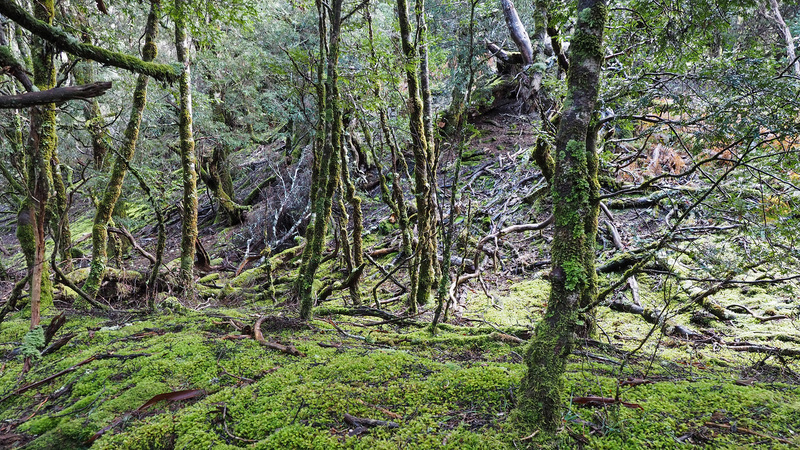 As you approach Pencil Pine Creek you also enter the most ancient looking rainforest. Everything looks so old and so alive at the same time. It literally looks like the forest from a fairy tale. The rainforest that you walk through on the Enchanted Walk. It’s easy to see how the Enchanted Walk got it’s name. At the end of the walk there is a bridge with views of the Pencil Pine Cascades. 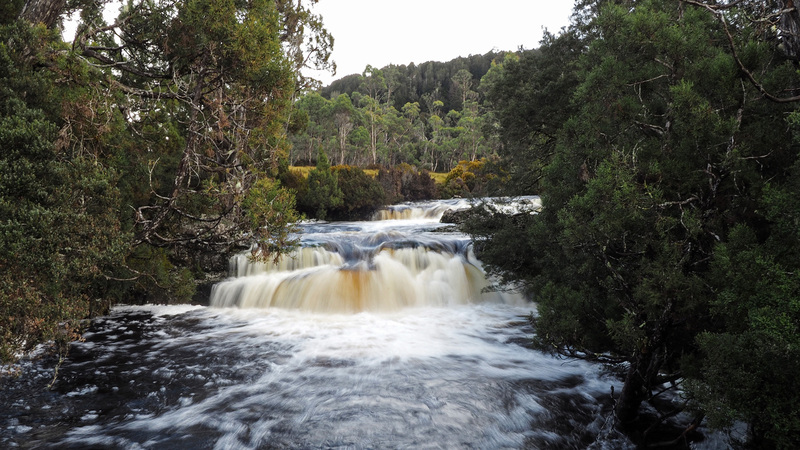 The cascades usually have the highest volume of water in winter as that is when Cradle Mountain receives most of its rainfall. As we were there in July there was quite a lot of water flowing and it made for another highlight on this short but beautiful walk. 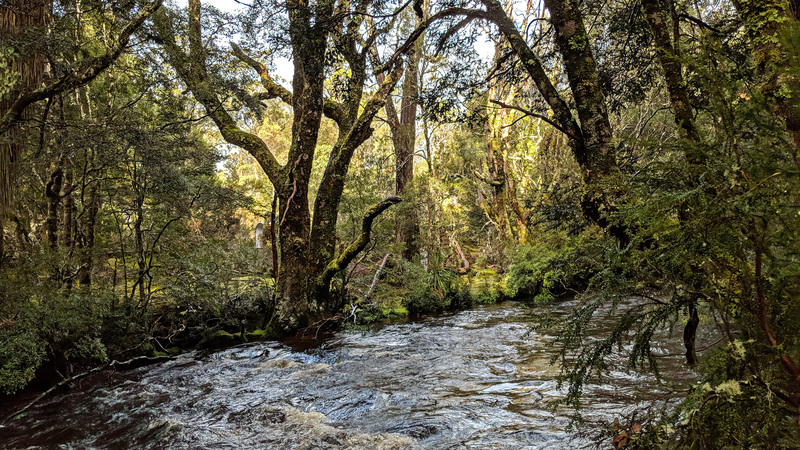 I was going to say that the walk would be really good for a family with young children but really it is worth doing for anyone who is visiting the Cradle Mountain area. We thoroughly enjoyed our time here. With that in mind I grabbed my waterproof gear and ventured out to Dove Lake!